Blowing up a balloon can leave you out of breath after a while. But what if you let science do the work for you? Today’s science activity is probably one that you’ve heard of before because it is a great way to observe the effects of a chemical reaction. You only need a few simple ingredients to follow six easy steps, and you are on your way! 1. Carefully pour vinegar into the bottle. 2. 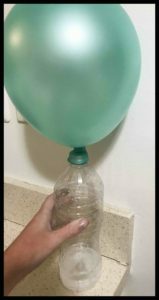 Stretch the balloon a little bit and make it ready to be able to put baking soda inside of it. I blew some air into the balloon to make sure that the sides of the balloon weren’t stuck together. 3. If using paper, roll the paper into a funnel and use tape to secure it. The narrow end of the funnel needs to be slightly smaller than the opening of the balloon but not too small where the baking soda will get stuck. 4. Pour the baking soda through the funnel into the balloon. Fill the balloon a little more than halfway. 5. 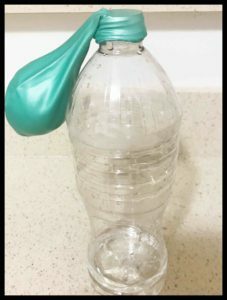 Stretch the opening of the balloon over the opening of the water bottle. Make sure that none of the baking soda falls into the vinegar while you are doing this. 6. Lift the balloon and allow the baking soda to fall into the vinegar. A chemical reaction will begin, and your balloon should start to inflate! A chemical reaction occurs when two substances, the reactants, are put together and begin to exchange molecules. This results in the formation of new substances, known as the products. 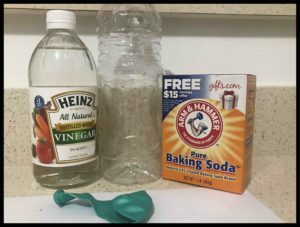 In this science activity, the baking soda and vinegar are our reactants. Whenever the baking soda is poured into the vinegar, the molecules begin to exchange particles immediately, causing the fizzing that you see. (If you touch the sides of the bottle where the reaction is occurring, you will also notice that the temperature of the substance has decreased!) As a result of this reaction, a new product is created: carbon-dioxide. The carbon-dioxide molecules are gas molecules, so they will expand to fill the container that they are in. Once they fill up the bottle, they will move into our balloon and cause it to inflate!